In gridiron football, a triple-threat man is a player who excels at all three of the skills of running, passing, and kicking. In modern usage, such a player would be referred to as a utility player. Triple-threat men were the norm in the early days of football, as substitution rules were stringent. Thus, in addition to the need for passing, running, and kicking skills, they were also required to play defense. As injury awareness grew and substitution rules loosened, teams shifted to kicking specialists, which made the triple-threat man obsolete. One of the last triple-threat men in professional football was George Blanda, a quarterback and kicker who last played for the Oakland Raiders of the National Football League in 1975. Danny White, a quarterback and punter, retired in 1989. Since then, non-specialists have placekicked only extremely infrequently in the NFL. One instance occurred when Doug Flutie—also adept at both running and passing as a "scrambling" quarterback—drop kicked an extra point in 2006 during the last play of his career. Danny White of the Dallas Cowboys was the last non-specialist to kick on a regular basis, as he served as the team's starting quarterback and punter from 1980 until 1984, after several years as backup to Roger Staubach. There are, however, still dual-threat quarterbacks and wildcat halfbacks, who can both run and pass. A quarterback who played wide receiver in high school or college may sparingly catch passes or be converted into a wide receiver who occasionally passes. For over forty years the NFL single-season scoring record was held by a triple-threat man, Green Bay Packers Hall of Famer Paul Hornung. Hornung set a record of 176 points in 1960 by scoring fifteen touchdowns, kicking forty-one extra points, and also kicking fifteen field goals. The record remained unbroken until 2006, when San Diego Chargers running back LaDainian Tomlinson scored 186 points. Unlike Hornung, who scored points three different ways, Tomlinson's points all came from touchdowns scored as he set an NFL record with 28 rushing touchdowns and 31 total. Possibly the only active triple-threat man is Taylor Heinicke, quarterback for the Old Dominion University Monarchs football team. Starting quarterback of the team, in 2012 he passed for 5,076 yards, ran for 470, and punted for 415 yards. 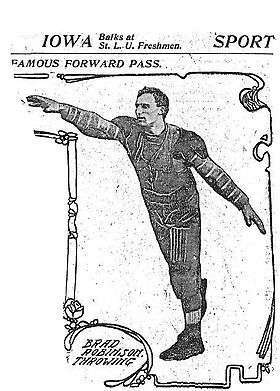 Saint Louis University's Bradbury Robinson, who threw the first legal forward pass in football history in 1906, was undoubtedly the first "triple-threat man". He was the Blue and White's premier passer and sportswriters of the era reported that he "excelled" as a kicker and was an "electrifying" runner. St. Louis Post-Dispatch sportswriter Ed Wray (John Edward Wray, 1873–1961) covered SLU football throughout Robinson's career. In an October 1947 column, Wray declared that the title of "first triple-threat man" belonged to Robinson "because throughout the 1906 season (St. Louis coach Eddie Cochems) used Robinson to pass, kick and run the ball... He was an A1 punter, too... And run!... This three way use of Robby added greatly to the team's offensive deception." Referee Horatio B. Hackett of West Point was amazed by Robinson’s passing. Hackett officiated major college games for three decades and was a member of football's rules committee. The Minneapolis Star quoted Lt. Hackett as saying of Robinson: "Whew, that chap is a wonder! He beats anything I ever saw. He looks as though 40 yards is dead for him, and he's got accuracy with it." Hall of Fame coach David M. Nelson (1920–1991) wrote that “St. Louis had a great passer in Brad Robinson.” In his book The Anatomy of a Game: Football, the Rules, and the Men Who Made the Game, Nelson marveled that Robinson threw a 67-yard pass in the 1906 season. “Considering the size, shape and weight of the ball”, Nelson concluded, such a pass was “extraordinary”. Sports historian John Sayle Watterson agreed. In his book, College Football: History, Spectacle, Controversy, he described Robinson's long pass as "truly a breathtaking achievement". Professor Watterson added that, "Robinson ended up using passes that ranged from thirty to more than forty yards with devastating efficiency". Robinson was also the Blue & White's principal kicker. 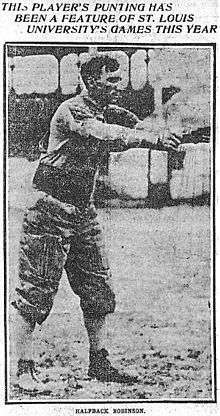 One sports journalist of the time opined that, "of the local kickers, Robinson of St. Louis easily excels all others. He is good for at least 45 yards every time he puts his toe to the ball and some of his punts have gone 60 yards." Robinson's prowess as a ballcarrier was particularly noted by a Columbia, Missouri reporter after a November 11, 1904, victory over the University of Missouri: "Robinson and (John) Kinney, the halfbacks of the visiting team were the fastest seen here in years and the Tigers seemed unable to stop them." Another writer at the game observed that Robinson's "offensive play was fast and in running back punts he gained much ground for his team, besides tackling well while on defensive." The St. Louis Globe-Democrat added, "Robinson's return of punts electrified the spectators time and time again. He was always good for a gain of 20 yards or more." On November 24, 1906, Yale's Paul Veeder completed a 20 to 30-yard pass in a 6-0 win over Harvard. As an outstanding runner and Yale's kicking specialist during his career, Veeder may have assumed the mantle of "triple threat" that Saturday before a crowd of some 32,000 at New Haven. The development of a true triple-threat man among the Eastern powers awaited their adoption of the forward pass as it had been pioneered at St. Louis. Knute Rockne, who popularized the forward pass at Notre Dame in the mid-1910s, observed, “One would have thought that so effective a play would have been instantly copied and become the vogue. The East, however, had not learned much or cared much about Midwest and Western football. Indeed, the East scarcely realized that football existed beyond the Alleghanies…”. Coach Nelson writes that the concept really took hold in 1912 when Carlisle coach Pop Warner "sprang his single wing or 'Carlisle' formation on the football world, and the triple-threat back was born." is well built, tall, and possessed apparently of natural football ability. He is a first-class punter, an excellent drop kicker, an adept thrower of forward passes and a hard, fast runner. He would be the ideal triple-threat man for the backfield. ↑ Miami Dolphins vs. New England Patriots, ESPN, January 1, 2006. ↑ "Kicking Contest At Yale". The Washington Post. 1905-04-19.